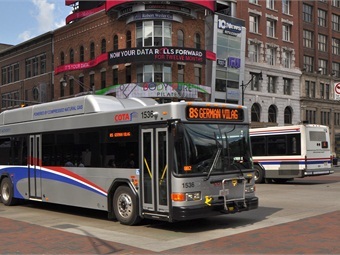 COLUMBUS, Ohio — WCMH reports that police are searching for a man wanted for robbing and assaulting a Central Ohio Transit Authority bus driver. Surveillance video obtained by the station shows the suspect snatching the unidentified driver’s purse while exiting the bus. The video later shows the suspect dragging the driver off the bus while she clings to her purse. Once outside the bus, that attack continues before the suspect wrestles the purse away and runs down the street. For the full story, click here.